Isn’t it the worst when you get all hyped up about something and then get totally bummed out at the result? Like how I hyped myself up for months before Opening Day that I was getting Skyline for lunch. Only to find Skyline with a line out the door and no tables in sight. Hype is certainly greater than Bum. So was the case in our visit to El Tenampa on Saturday night. Weeks of hype lead to one big bum. As you all know, I love me some Mexican food. Lozanos tacos, La Fogata tostadas, Grandma Rosas tortillas…all delicious examples of Mexican fare that I love. We had found El Tenampa online and read rave reviews about it. 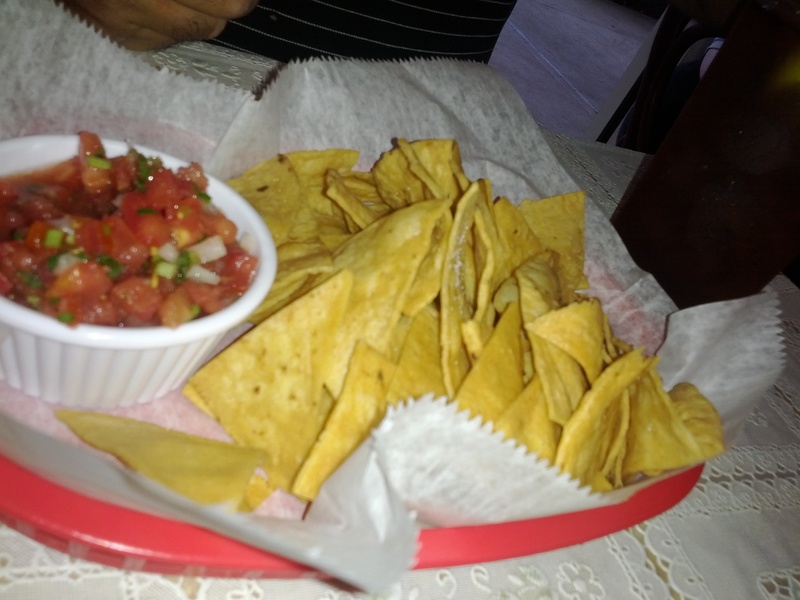 Located in Estero, it was said to have great homemade salsa and authentic Mexican food. On Saturday night, Mommy, Gino and I went to give it a try. We arrived to a small restaurant with a large takeout counter and 10 or so tables. We sat ourselves, found the menus and were greeted by the waitress. The restaurant was very clean and the service was great. After brief review of the menu, I decided I would try a bit of everything. They didn’t really have a combination tray of a lot of items and all of the items were priced pretty cheap. I figured this meant they were all pretty small. I ended up ordering 2 hard tacos, 1 tostada and 1 bean burrito. While we waited for our food, we munched on some chips. 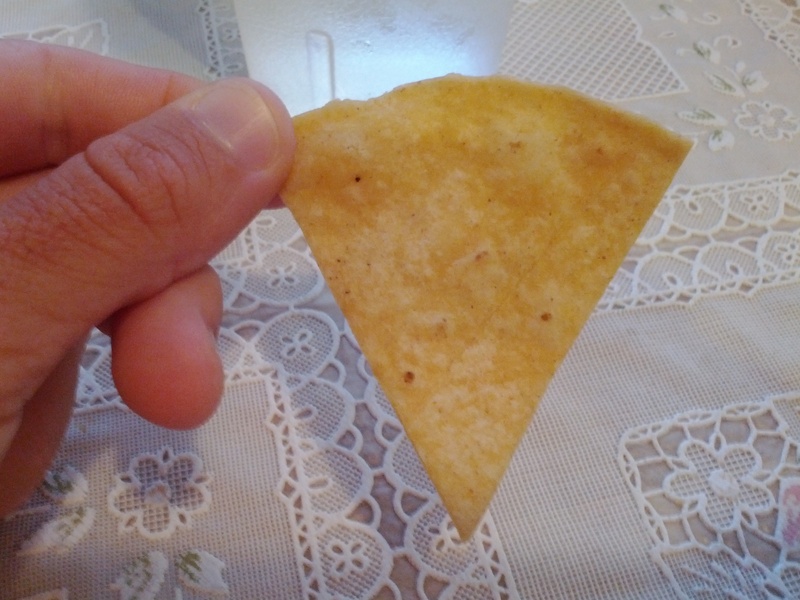 These were the thickest homemade tortilla chips I have ever had. Each chip was thick in consistency, lightly salted and fried to a crispy perfection. I liked that these chips were so thick because they sat them apart from the others. The homemade salsa was okay but nothing to write home about. Pico de Gallo in style, it was cold, tasty and simple. Our food arrived very quickly and as soon as it was placed down, I could tell this was much more homemade tex-mex then homemade Mexican. Though briefly bummed about this, I got over it pretty quickly because I do too include the tex-mex cuisine. I started off with the tostada. This was one of the most disappointing parts of my meal. The tostada shell was certainly out of a bag. There was no pretending this was homemade. It was topped with a small layer of refried beans that were probably homemade but very salty. The lettuce was fresh and shredded and there was a large serving of diced tomatoes as well. The diced tomatoes, while not Pico, did indeed have another ingredient. This made them very sweet and juicy. 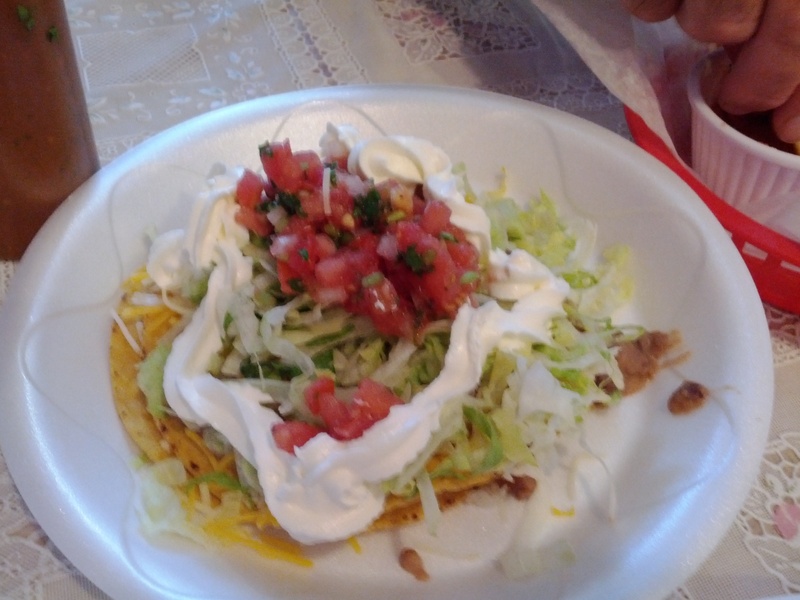 The tostada was topped with a ring of non-authentic sour cream and some shredded cheese. Overall, this tasted salty and less authentic then the ones I prepare at home. Bum. Next up was the bean burrito. As soon as I saw it, I knew the tortilla was not homemade. This was another bummer. Again, packaged tortillas are fine but nothing even comes close to homemade tortillas. 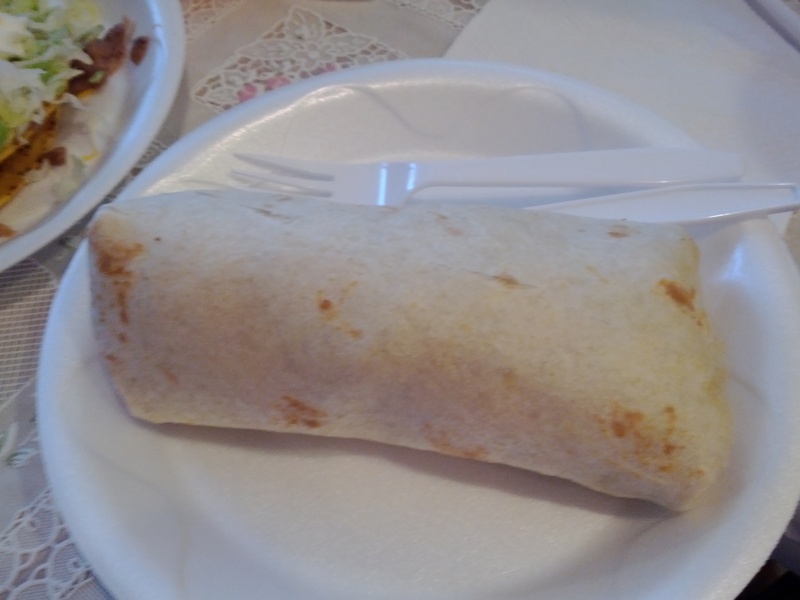 The burrito was filled with beans, tomato-mixture, lettuce, cheese and sour cream. The burrito was way bigger than I was ever expecting. Due to the tomato mixture, the burrito tortilla get soggy almost immediately. This left my mouth with a soggy, mushy tortilla along with some salty, refried beans. Not a great combination. The sogginess also made the burrito nearly impossible to pick up. Whatever seasoning they fancied, was the equivalent of salt, salt, salt, salt. Bum. 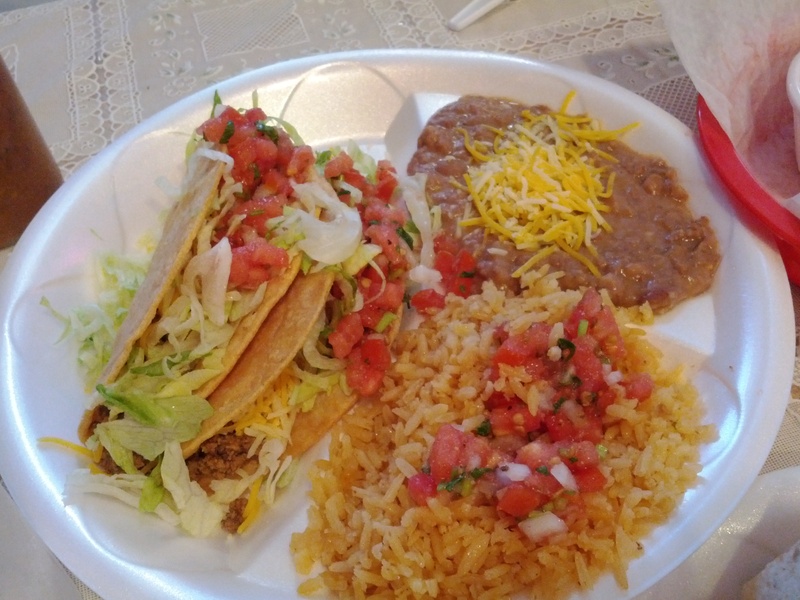 For sure, the highlight of the meals was the tacos. The two tacos appeared to be in homemade hard taco shells and when I began to eat them, this was confirmed. Even though the ground beef was dried out and salty, the shells and other toppings made these tacos pretty good. Lozanos good, well no, but pretty good indeed. The lettuce & cheese was fresh and tasted so good with the shell. Homemade hard taco shells have a very particular crunch to them – a crunch that cannot be conceived with a store bought shell. I easily downed these two tacos in only a few bites. They were a bit smaller than a normal taco but right on par for a homemade taco. Hype was almost there. I also had some rice and beans but, ended up giving almost my entire serving to Mommy. The few bites I had were very salty. The beans were okay but just not that great. As for the rice, I found it to be dry and lacking definition. Neither Mommy (burrito) nor Gino (enchiladas) were impressed with their meal either. El Tenampa was not authentic Mexican food but rather authentic tex-mex food. I guess the writers of all of the rave reviews have some Authentic eating to do. We have been talking about this restaurant for almost two months now and it was really a bummer that it was just not that great. If the food would have been seasoned correctly rather than with sodium, I think El Tenampa would make a great tex-mex restaurant. As I mentioned, the service was great and the restaurant was nice and clean. 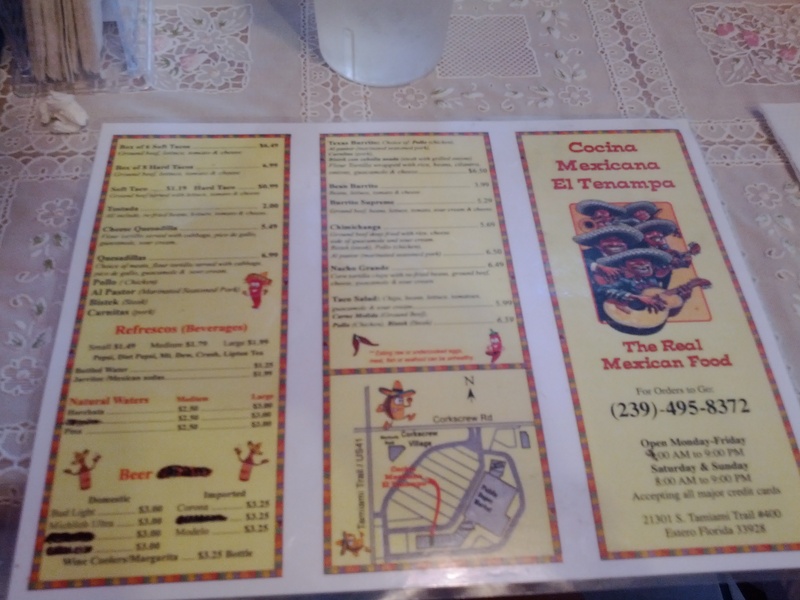 I have no desire to go back especially since I live within driving distance to some fantastic, truly homemade Mexican fare. El Tenampa did not do it for me and the Hype Before the Bum kicked me…right in the bum.